Commission for the Chatham Heart Center in Mesa, AZ. Dr. Jean Chatham first saw my work at the Scottsdale Art Festival in March 2009. 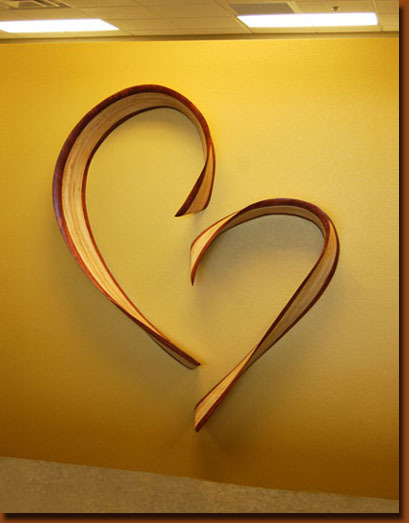 He commissioned me to design a piece for his new building, which will house the offices of his cardiology practice. 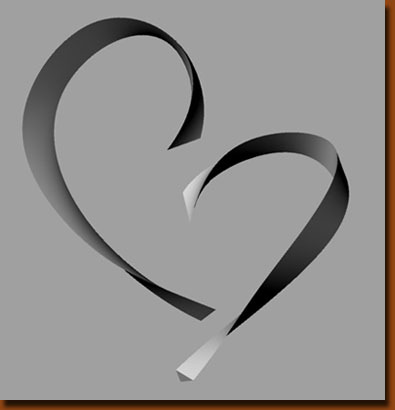 He asked me to design a wall sculpture that would be a very abstract heart form. He chose a design from the various design ideas I proposed. The computer generated image for the design is shown on the right. Similar to most of my "Wave" wall sculptures, this work is constructed of layered Baltic Birch with a contrasting hardwood trim. In this case, the trim is Bubinga. 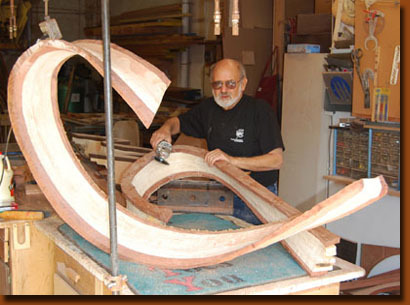 In the photo (left), all of the rough-cut layers of wood have been assembled, and the process of carving the sculpture to its final shape is underway. Various power grinding tools are used for this part of the process. 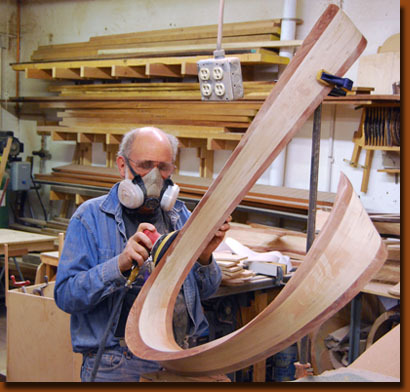 The final step in the carving process involves power sanding of the sculpture. Sanding removes the marks left by the grinding tools and allows me to fine tune the sculpture's graceful curves. When sanding is complete, the sculpture is ready for the final finish. The heart sculpture was installed in the Chatham Heart Center on February 10, 2010, in time for their Open House. Additional images of the Chatham Heart Sculpture are available here.